Is this Pixar's first musical? Yes, but not quite. 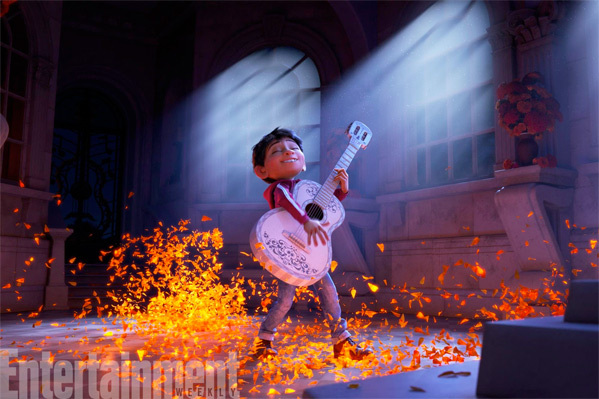 EW.com has debuted a first look photo from Pixar's Coco, their next big original movie coming out in 2017 (the other one Pixar is releasing is Cars 3). Coco is a film set around the Mexican holiday the Day of the Dead (or Dia de Muertos), and is about a young boy. In the photo, we can see him holding a guitar playing a song while some colorful confetti kicks up around him. Anthony Gonzalez voices Miguel, and the all-Latino voice cast includes Gael García Bernal, Benjamin Bratt and Renee Victor. Coco isn't exactly "a break-out-into-song musical," but rather, one "set against the backdrop of musical performance." Reminds me of the fantastic Kubo and the Two Strings. See below. The short synopsis is quite vague: Pixar's Coco follows a 12-year-old boy named Miguel who sets off a chain of events relating to a century-old mystery, leading to an extraordinary family reunion. Coco is directed by filmmaker Lee Unkrich (of Toy Story 2, Monsters Inc, Finding Nemo, Toy Story 3) and co-directed by Adrian Molina, who also wrote the screenplay. As explained in the EW article: "This is a story we want to share with the world, but it’s also been particularly important to us that when the Latino community sees the film, that it resonates and it feels like we got it right, and that’s what we’re really trying to do. We all feel the gravity." Disney will release Pixar's Coco in theaters in 3D starting on November 22nd, 2017 next fall. Day of the Dead and Pixar? Sign me up yesterday. I really enjoyed "The Book of Life". It will be interesting to see Pixar's take on Day of the Dead.